What inspires you in the kitchen? Is it a certain recipe? An ingredient you find yourself drawn to at the grocery or market? A type of cooking or cuisine? Maybe even a person? I’ve been inspired by all of these things at one time or another. A few weekends ago it was the ingredients, two of my purchases at the Indy Winter Farmers Market—the eggs from my favorite Schact Farms (where I also purchased some leaf lard that for pie crusts same weekend!) and some delicious greens from a farm that I’m embarrassed to say I don’t remember the name of. I came home starving and ready to just throw some food together. I’d reached the point of hangry, AKA the point of no return, AKA I need food simply to fuel my body and am no longer concerned with how it tastes. This is the point at which I sometimes stand at the counter and eat dry granola from the box. Thank God I accidentally made the best breakfast/brunch meal ever. This is just a pile of simple and good ingredients. We’re talking greens with flavor (if you’ve only eaten iceberg lettuce or a bagged salad mix, brach out to some fresh and not bagged other greens like arugula, butterhead lettuce, or mustard greens. Mind-blowing. ), earthy potatoes, spiced chickpeas, mushrooms, and peppers (leftovers in my kitchen from chickpea and roasted vegetable fajitas), all topped with bright yellow runny yolk eggs. This is delicious, easy, healthy fuel. This is what you should be stuffing into your face on a weekly basis. Hello from the Philadelphia airport! I am on my way to Madrid, Spain to meet up with Michael, his sister, and his mom and stepdad! It’s been three long months since Michael left for Sweden. The wi-fi here is atrocious. This is 2012, people! Get with the wireless world. So hopefully I can get this post finished. However, when you read this I’ll be in Madrid already. So technically, hello from Madrid? Traveling stresses me out only a little bit. Let’s just say this has been a long week, and I won’t drink coffee at night when I’m anxious anymore. The only thing I’ve had planned out for weeks is my travel outfit. Does that sound dumb? Comfort is of the utmost importance when you spend a day and night traveling. Plus, if you want to bring anything extra bulky (like boots), you should probably work them into your travel outfit so as not to have to squash them into your suitcase. Plus, hair gets flat, greasy, and unfortunate after hours on a plane. Thank goodness for braids and head scarves. 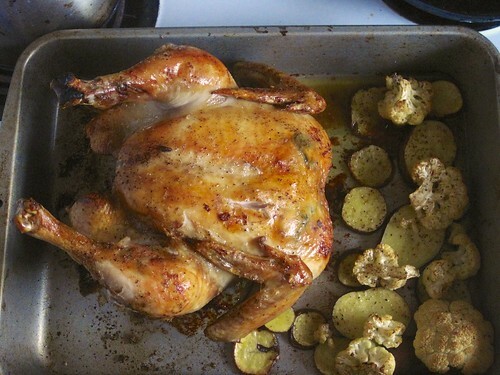 Two weeks ago Michael and I had another cooking date—a whole roasted chicken. While this may sound slightly intimidating, trust me, it’s not. And a roasted chicken is just about the best thing you can put in your oven on a Sunday afternoon. Why? Well I’ll just tell you. A roasted chicken is super hands off. Prep it the day before you plan to roast it by spicing it up a bit. Put it in the oven for an hour to an hour and a half. That is it! If you are one or two people a whole chicken will feed you for at least a week. This makes the cost worth it. Chicken on salads, chicken in enchiladas, chicken on pasta….endless possibilities. 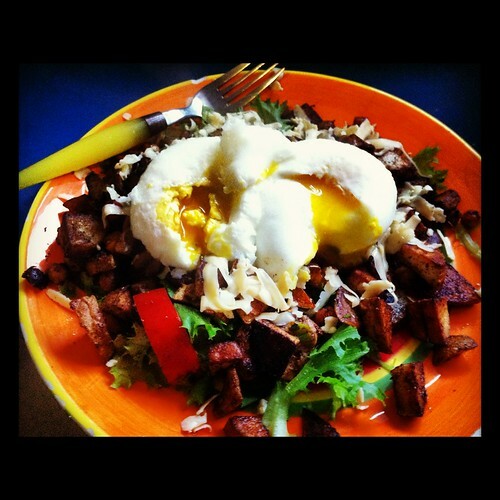 Get creative with your leftovers! Chicken parts (bones, innards, the back) are great for homemade stock. Freeze that business and use it once you’ve gathered enough chicken parts and vegetables. Thanksgiving is right around the corner (how in the world did that even happen already?!) and maybe you don’t celebrate with a large group of people. A chicken is a great smaller alternative to a turkey. Now, where do you get a whole chicken? I suggest you get yourself to a local butcher or venture to a nearby farmers market and make friends with a chicken farmer. Either of these places will sell you a lovely local whole chicken. Whole Foods or Fresh Market are also excellent options. Michael did a great job with this recipe as a beginner cook. He even proudly pulled legs and a breast off of the cooked chicken, and was amazed at how the breast looked just like a boneless chicken breast he’d buy at the store. 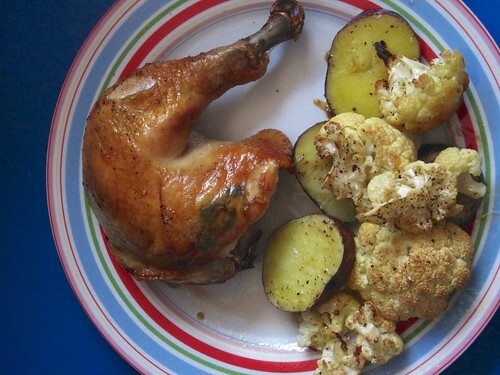 I roasted some seasonal vegetables (oh so frickin fancy, let me stick my nose in the air, lalala)—cauliflower and potatoes. Put them in the roasting pan with the chicken when there’s about half an hour of cooking time left. Just sprinkle some salt, pepper, and olive oil over them! I also happen to like a little curry on my cauliflower.